Seoul’s first so-called living lab is a traditional Korean village nestled on a hill in the center of the city. 서울의 첫 ‘리빙랩(living lab, 살아있는 실험실)’은 도시 중심부에 위치한 북촌 한옥마을이다. The famed Bukchon Hanok Village, with its quaint wooden houses and quiet courtyards, might seem like the last place one would find the latest technology for hypermodern urban living, but hidden in the neighborhood’s winding streets and alleyways are state-of-the-art sensors that can do everything from locate empty parking spots to detect fire hazards in the village’s famed wooden homes. 관광 명소로도 유명한 이 마을은 전통 가옥들과 고요한 분위기 때문에 도시 생활을 위한 최첨단 기술과는 거리가 멀어 보인다. 하지만 이곳의 꼬불꼬불한 골목길 곳곳에는 첨단 기술이 적용된 센서가 숨어있다. 이 센서는 빈 주차장을 인식해 찾아주는 것부터 불에 취약한 한옥의 습도와 온도 등을 실시간으로 모니터링 해 화재를 방지하는 등 다양한 기능을 수행하고 있다. “센서가 매우 작기 때문에 잘 안보이실 거에요.” 서울시 김유식 주무관은 이렇게 말하며 “하지만 이곳에선 사물인터넷(Internet of Things)를 활용한 17가지 프로젝트가 2015년부터 진행되고 있습니다. 그중 몇 개 프로젝트는 중단되기도 했지만요”라고 설명했다. The Bukchon living lab is a public-private partnership between the Seoul Metropolitan Government and local IT companies. 북촌 한옥마을의 리빙랩은 서울시와 국내 IT 기업이 공동으로 조성한 실험 공간이다. The government gives tech firms permission to use certain parts of the city to test wireless sensors, cameras and other so-called Internet of Things, or IoT, technology to provide services to residents depending on their needs. Based on residents’ feedback, companies can continue or pull out their projects. 서울시는 기술 기업들이 일정 지역에서 무선 센서나 카메라 등 사물인터넷(IoT) 서비스를 테스트해볼 수 있도록 허가해주고, 기업들은 서비스를 이용하는 주민들의 피드백을 반영해 해당 서비스를 계속하거나 중단할 수 있다. 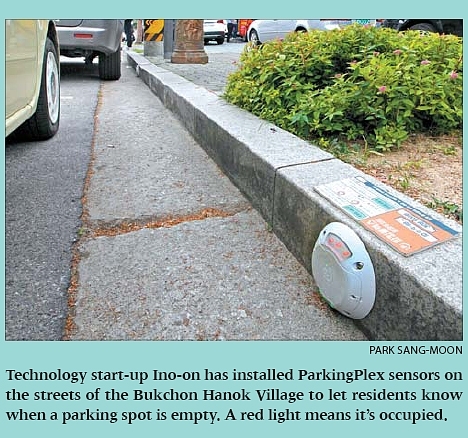 In the Bukchon Hanok Village, for example, the sensors can help drivers find empty parking spots through a mobile app called ParkingPlex. 구체적인 예로 북촌 한옥마을에는 관광객들이 손쉽게 주차 공간을 찾을 수 있도록 도로변에 ‘파킹플렉스’라는 센서를 설치했다. ParkingPlex, operated by a local IoT company Ino-on, is a parking lot sharing service, almost like an Airbnb for private parking lots. It connects drivers with spaces in private and residential lots. 파킹플렉스는 IT 기업 ‘이노온’이 운영하는 주차장 공유서비스다. 미국의 숙박 공유서비스 ‘에어비앤비’와 유사한 방식으로 사적인 주차 공간이나 거주자 우선 주차장에 대한 정보를 운전자들과 앱을 통해 실시간 공유한다. As of March this year, it has connected 60 parking lots around the districts of Jongno, Eunpyeong and Seodaemun in Seoul. The company aims to expand its reach and add more lots to the service. 지난 3월까지 이 앱을 통해 서울 종로구·은평구·서대문구에 있는 60곳의 주차 공간이 연결됐다. 이 회사는 앞으로 공유되는 주차 공간을 늘려나가고 서비스를 확대한다는 계획이다. 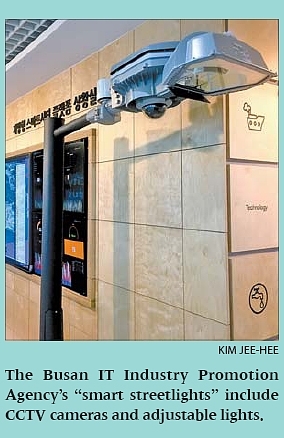 Since last year, the city has been experimenting with IoT devices in the residential district of Geumcheon in southwestern Seoul and popular tourist destinations like Hongdae, Sinchon and Gangnam, with the stated goal of making best use of IoT technology. 지난해부터 서울시는 북촌 한옥마을 외에도 여러 지역에 리빙랩을 구축해 사물인터넷 서비스를 테스트하고 있다. 서울 금천구의 주거 지역이나 관광지로 유명한 홍대·신촌·강남 등에서도 지역 특색에 맞는 사물인터넷 서비스를 적용해 운영 중이다. This year, the city government plans to spend more than 5.87 billion won ($5.2 million) to foster living labs and other related projects. 올해 서울시는 리빙랩 사업 및 그와 연관된 프로젝트에 58억여원을 투자한다는 계획이다. Elsewhere in Korea, the Ministry of Science, ICT and Future Planning and government-run National IT Industry Promotion Agency have launched similar IoT test sites in Busan and Daegu, each with a plan to spend more than 20 billion won over a span of three years. 서울시뿐 아니라 부산시와 대구시에서도 사물인터넷 실증 사업이 진행되고 있다. 미래창조과학부와 정보통신산업진흥원은 공모를 통해 부산과 대구에 테스트 구역을 선정하고, 2015년부터 2017년까지 3년 간 각각 약 200억원씩을 투자해 실증 사업을 벌이고 있다. The city of Goyang in Gyeonggi began a two-year project with a 6.56 billion won investment. 경기도 고양시 역시 지난해 사물인터넷 시범단지 조성사업 지역으로 선정됐다. 총 65억6000만원이 투자되는 사업으로 2년간 실증 사업을 진행한다. The push by Korean cities to develop their technological infrastructure is one answer to a large question facing megalopolises around the world: what is the future of urban living? 한국의 도시들이 이처럼 기술 인프라를 구축하기 위해 노력하는 것은 전세계의 대도시들이 직면하고 있는 공통의 질문에 대한 답을 찾기 위해서다. 그 질문이란 ‘도시 생활의 미래는 어떤 모습인가?’이다. As city populations continue to grow, mere expansion of physical infrastructure will no longer hold. Problems like traffic congestion, waste, pollution and crime will become more taxing and require smarter solutions. 도시 인구가 계속 증가함에 따라 물리적 인프라의 확대만으로는 교통난·쓰레기·범죄 등의 문제를 감당할 수 없게 됐다. 이런 문제들은 결국 더 똑똑한 해결책을 필요로 한다. Thus many cities, from Seoul to Singapore, are turning to new technologies for the answer. 서울·싱가포르 등 세계의 많은 도시들은 기술에서 그 해답을 찾으려 한다. In India, Prime Minister Narendra Modi has pledged to turn 100 urban areas into so-called smart cities. 인도의 나힌드라 모디 총리는 2014년 총선에서 2022년까지 인도 내 스마트시티 100개를 건설하겠다는 공약을 내세웠다. In Barcelona, Spain, Mayor Xavier Trias began a similar initiative after his election in 2011, installing touch-screen monitors at bus stops with real-time schedules, maps and locations for public bikes. 스페인 바르셀로나의 사비아르 트리아스 시장은 2011년 취임 직후부터 스마트 시티 건설을 위한 사업들을 시작했다. 버스 정류장에 터치스크린 모니터를 설치해 사용자들이 실시간 버스 도착 시간, 주변 지도, 공공 자전거 시설에 대한 위치 정보 등을 확인할 수 있도록 했다. Singapore, a financial powerhouse, wants to be the first smart nation in the world, and closer to home, the city of Incheon has built the Songdo International Business District from the ground up with technological infrastructure in mind. 금융 강국인 싱가폴은 세계에서 가장 똑똑한 국가 즉 ‘Smart Nation’이 되겠다고 선포했다. 인천 송도는 도시 기획 단계에서부터 스마트 시티를 위한 기술 인프라를 고려했다. “2050년까지 전 세계 인구의 3분의2는 도심에서 살게 될 것이다.” 존 챔버스 시스코 전 회장은 책 『스마트 시티와 디지털 국가(Smart Cities and Digital Nations)』의 서문에서 이렇게 말했다. Lee Ye-ji, a 26-year-old resident of Yongin, Gyeonggi, starts every morning by opening up the Kakao Bus and Kakao Subway apps on her phone. 경기 용인시에 거주하는 이예지(26)씨는 스마트폰에서 카카오 버스와 카카오 지하철 앱을 여는 것으로 하루를 시작한다. The apps tell her the fastest way to get to work and also let her know what time a bus or train is arriving. 이 앱들은 그가 직장에 가장 빠르게 도착할 수 있는 대중교통 수단뿐 아니라 언제 어떤 버스나 지하철이 도착하는지까지 실시간으로 알려준다. “예전엔 매번 눈 앞에서 버스를 놓쳤어요. 그럴 때면 왜 내가 뛰지 않았을까 후회하곤 했죠. 하지만 이제는 집을 나서면서 내가 뛰어야할지 아닐지를 앱을 통해 확인하기 때문에 버스를 놓치는 일이 거의 없어요.” 이씨는 이렇게 말했다. One of the biggest headaches in any urban area is traffic. A bigger population means more cars, which means more congestion and pollution. 교통 문제는 도시 문제의 가장 큰 골칫거리다. 인구의 증가는 자동차의 증가를 의미하고, 이는 곧 교통 혼잡과 대기 오염으로 이어진다. To overcome these problems, cities around the world are focusing on making their public transport systems more efficient and easier to use, with the hope that changes will boost ridership. 이런 문제를 해결하기 위해 도시들은 대중교통을 더욱 효율적이고 쉽게 사용할 수 있도록 만들어 자가용 대신 대중교통을 이용하도록 유도하고 있다. IT 기업 카카오가 만든 앱들은 서울시에서 구축한 교통정보시스템(Topis) 정보를 활용한다. Topis for short, which began in 2004 as the city’s transport control center. One of the most notable projects under its purview is the digital signage at bus stops that tells commuters when a bus will arrive. The most recent update to the system last month included a feature that can indicate whether a bus is full. 서울 ‘토피스’는 2004년 설립된 서울시 전체의 교통 관할 컨트롤 타워다. 이 시스템 도입 이후 가장 눈에 띄는 변화는 서울시의 버스 정류장마다 디지털 표지판이 세워진 것이다. 이 표지판에는 각 버스의 도착 시간과 현재 위치 등이 표시된다. 최근 업데이트된 기능은 도착하는 버스 안에 얼마나 많은 사람이 타고 있는지 표시해 주는 것이었다. The system has worked so well that Topis has exported it to countries like Azerbaijan, Colombia and Mongolia. 서울시 교통정보시스템은 그 우수성을 인정받아 아제르바이젠, 콜롬비아, 몽골 등 세계 곳곳으로 수출되고 있다. 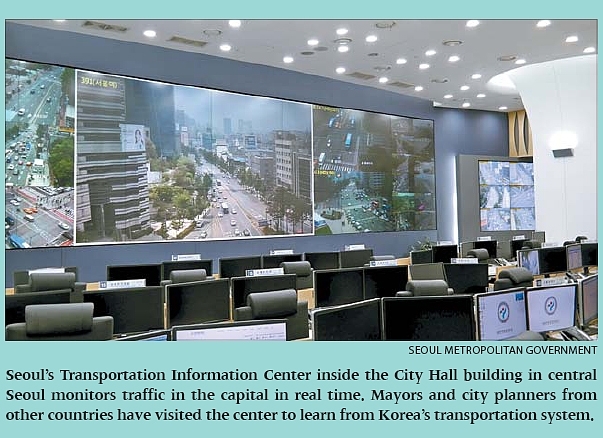 “Foreign mayors and decision makers in city planning frequently visit Seoul to take the Topis program to their countries,” said Yang Youn-gye, a director at the Seoul city government’s Transportation Information Center. 서울시 교통정보센터 양윤계 주무관은 “지금까지 많은 도시의 시장과 도시 계획 관계자들이 토피스를 벤치마크하기 위해 서울을 다녀갔다”고 전했다. Aside from public transportation, cities are also trying to create better parking systems. 도시들은 주차 시스템 개선에도 노력을 기울이고 있다. An IBM study estimates that 30 percent of urban congestion around the world is caused by drivers looking for a parking spot, so any improvements that help drivers more easily find parking space could cut down on traffic. IBM에 따르면 전 세계 교통 혼잡의 30퍼센트는 주차 공간을 찾는 운전자들에 의해서 발생한다. 따라서 운전자들이 좀 더 빠르고 쉽게 주차 공간을 찾을 수 있도록 돕는 것은 운전자뿐 아니라 도시의 교통 혼잡 개선에도 도움이 된다. In Korea, start-ups are developing apps to do just that. Modu Company, creator of the parking lot sharing app Modu Parking, signed partnerships with local district offices in Seoul including Seocho, Dongjak and Yongsan so that citizens can share their residential parking lots as well as public parking areas. 한국의 주차장 공유 앱 ‘모두의 주차장’은 국내 스타트업 '모두 컴퍼니'가 주차 문제 해결을 위해 만든 앱이다. 이 앱은 서울 서초구·동작구·용산구 등과 파트너십을 맺고 공공 주차공간뿐 아니라 거주자우선 주차 공간의 공유 서비스를 제공하고 있다. Similar options exist in the United States. 미국에도 유사한 서비스가 운영 중이다. An app developed by Streetline called Parker can help direct drivers to spaces in empty lots based on users’ selection of a street and lets them know price, payment options and hours available for each lot. Covered cities include Los Angeles, Boston, Indianapolis and Washington, D.C.
스트릿라인이 개발한 앱 ‘파커’는 거리명을 선택하면 근처의 빈 주차 공간을 찾아준다. 주차요금, 지불방법, 주차 가능시간 등도 확인할 수 있다. 미국 로스앤젤레스·보스턴·인디애나폴리스·워싱턴 D.C. 등 여러 도시에서 이 주차 공유 서비스가 이뤄지고 있다. Environmental concerns are also driving cities’ technological upgrades. 환경 문제 해결을 위한 기술 발전도 이뤄지고 있다. In 2025, the amount of waste generated by cities around the world is expected to reach 2.2 billion tons, up from 1.3 billion in 2012, according to the World Bank, and the cost to manage that waste is likely to rise to $375.5 billion by 2025 from $205.4 billion in 2012. 세계은행에 따르면 2012년 13억t이던 전세계 도시 쓰레기의 양은 2020년 22억t에 달할 전망이다. 이 쓰레기를 관리하는데 드는 비용은 같은 기간 2054억 달러에서 3755억 달러로 증가할 것으로 추산된다. The city of Goyang in Gyeonggi thinks it’s come up with a way to efficiently manage waste removal. 경기도 고양시는 효과적인 쓰레기 관리 체계를 개발하고 있다. 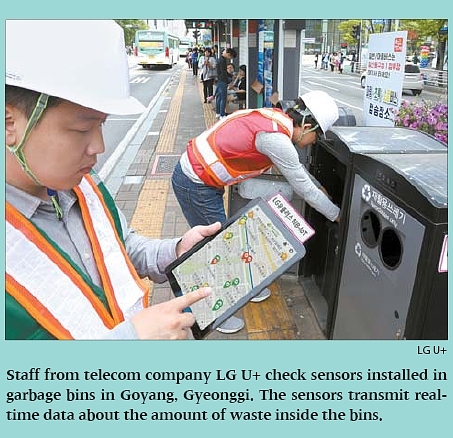 Around 200 garbage bins in the city have wireless sensors installed by telecom company LG U+ that can notify street sweepers via mobile app when a bin needs to be emptied. 고양시에 있는 쓰레기통 200여 개에는 무선 센서가 부착돼 있다. 이 센서들은 LG유플러스에서 제공하는 사물인터넷 망을 통해 각 쓰레기통을 언제 비워야 하는지를 환경미화원들에게 알려준다. The government has also installed 30 solar-powered trash compactors around the city. 고양시는 또 30여 개의 쓰레기통에 태양광 에너지를 이용해 쓰레기통에 쓰레기가 가득차면 자동으로 압축하는 기능을 장착했다. Both types of waste bins in Goyang, developed by a local company Ecube Labs, are being exported to other countries for their efficiency. Last year, 25 of the sensor-equipped bins were installed in Washington, D.C., and 100 more are expected to be installed in Los Angeles this year. From there, the government and company hope to expand their global presence. 이 두 종류의 쓰레기통은 모두 국내 ‘이큐브랩스’라는 회사에서 만들었다. 지난해 이 회사는 센서가 부착된 쓰레기통 25개를 미국 워싱턴 D.C.에 수출했고, 올해엔 로스엔젤레스에 100여 개를 수출할 예정이다. 고양시와 이큐브랩스는 이를 통해 세계 시장에서 스마트 쓰레기통의 인지도를 높일 수 있을 것으로 기대하고 있다. Cities are also trying to save energy by installing smarter streetlights. 스마트 가로등 또한 에너지 절감에 효과적인 수단이다. Rather than just lighting up at a programmed time, which most streetlights currently do, smart ones are equipped with motion detectors to light up only when a person or car passes by. 스마트 가로등은 미리 지정된 시간에 꺼지고 켜지는 것이 아니라 지나다니는 사람이나 차 등을 인식해 필요할 때만 빛을 밝힐 수 있다. Cities with a network of such lights can save as much as 70 to 80 percent on maintenance and electricity costs, industry experts say. 전문가들은 이러한 스마트 가로등 인프라가 구축되면 가로등 정비와 전기 공급에 들어가는 비용을 70~80퍼센트 절약할 수 있을 것으로 예상한다. A similar smart lighting system was installed and has been tested in Busan since 2015. The southeastern port city has been experimenting with fixing streetlight poles with CCTV cameras, beacon lights and fine-dust sensors. 부산시에서는 이러한 스마트 가로등을 2015년부터 해운대 주변에 설치했다. 스마트 가로등에 CCTV, 비콘, 미세먼지 센서 등을 부착하는 실험도 진행 중이다. On May 12, a 4-year-old boy was locked in a bus for over two hours after he dozed off on his way to a day care center in Gyeonggi. 지난달 12일 경기도 과천에서는 만 4세 남자 아이가 어린이집행 버스에서 잠을 자다가 두 시간 넘게 버스 안에 갇히는 사건이 발생했다. The bus had arrived at the center, but no one noticed he was still on the bus until a passerby happened to spot him trapped inside. 버스는 어린이집에 도착했지만 아이가 버스에서 내리지 않았다는 사실을 아무도 몰랐던 것이다. The child has since enrolled in counseling programs following the incident, and his parents have sued the center. 이 사건의 충격으로 아이는 심리 상담을 받아야 했고, 아이의 부모는 어린이집을 고소했다. The case spawned a nationwide conversation about how to better track kids and ways that technology can help. 이러한 사고는 어떻게 하면 기술을 통해 아이들이 더 안전하게 살아갈 수 있도록 할 것인가에 대한 관심을 불러일으킨다. An app called KidsBus, developed by Korean start-up Egencomz, was one of the participants in Seoul’s living lab project last year in Geumcheon District, southern Seoul. 스타트업 ‘이젠컴즈’가 개발한 앱 ‘키즈버스’는 지난해 서울 금천구의 리빙랩 프로젝트에 참여했다. The app is wirelessly connected to a sensor that can be attached to a child’s wrist or bag and let parents track the location of their children. The app can also be linked with the bus so drivers can let parents know when a child has arrived at school. 이 앱은 아이의 팔이나 가방에 부착된 센서를 통해 부모들에게 아이의 위치를 알려준다. 또 버스 운전사의 앱과도 연결돼 아이가 버스에 탑승했는지, 하차했는지를 확인할 수 있다. While the service started in partnership with Woonhyun kindergarten in the living lab district, it has since expanded business to more than 20 kindergartens, elementary schools and private academies. 금천구 운현유치원과의 시범 운영을 시작으로 현재는 20여 곳의 유치원·초등학교·학원으로 확대됐다. Korean IoT start-up Lineable has also released a smart band product with IoT sensors that can alert parents when kids run 20 to 30 meters (66 to 98 feet) away from them. 스타트업 ‘리니어블’도 사물인터넷을 활용해 아이의 위치를 추적할 수 있는 스마트 팔찌 제품을 출시했다. 이 제품은 아이가 부모로부터 20~30m 떨어지면 부모에게 신호를 보내 이를 알린다. Although cities around the world are installing wireless sensors on their streets, transportation trackers on their buses and cameras in their neighborhoods, the “smart city” movement is still in its infancy. 세계의 도시들이 거리마다 무선 센서를 설치하고, 대중교통의 위치를 추적하고, 감시 카메라 설치를 확대하고 있지만 스마트 시티로의 전환은 아직 초기 단계다. According to the National IT Industry Promotion Agency, a government-run institute in Korea, only 15 percent of the world’s metropolises are expected to commit to becoming smart cities by 2025. 정보통신산업진흥원은 2025년까지 전 세계 도시 가운데 15퍼센트만이 스마트 시티의 범주에 들 수 있을 것으로 예상했다. In Korea, regulations are seen as an impediment to implementation of new technologies within cities. 한국의 경우 도시의 디지털화를 충분히 실현하기에는 아직 관련 규제가 많은 상황이다. 부산정보산업진흥원 스마트시티사업부 김덕신 팀장은 “날씨에 따라 조도를 조절하는 스마트 가로등의 경우만 해도 조도에 대한 규제 때문에 적용이 어렵다”며 “이외에도 엄격한 개인정보보호법 때문에 유용한 정보와 데이터를 공유할 수 없는 경우가 많다”고 말했다. Many other cities around the world face the added obstacle of already established and aging infrastructure. 세계의 많은 도시들에선 이미 구축된 인프라가 스마트 도시로 가는데 있어 걸림돌이 되는 경우도 있다. Korea has managed to work around that issue - by building whole cities from scratch, and equipped with the latest technology. Perhaps the best example is the Songdo International Business District in Incheon, which was built with an integrated infrastructure in mind. 반면 한국은 기획 단계에서부터 최첨단 기술을 탑재한 스마트 도시를 건설하기도 했다. 한국의 송도가 그 대표적인 예다. Through the city’s network, citizens can have immediate access to a host of urban services including health care, government, transportation, utilities and security when they need it. 송도 시민들은 도시의 네트워크를 통해 건강관리, 행정업무, 교통, 보안 등 도시 생활에 필요한 각종 서비스에 편리하게 접근할 수 있다. For instance, if a fire is detected by a sensor, firefighters are immediately alerted without needing someone to call. Water, electricity, density of fine dust and parking lot availability are all monitored through the city’s control center. 도시 어딘가에서 화재가 발생했을 때 누군가 전화를 걸지 않아도 소방서에서 즉각 감지해 대처한다. 도시 관제센터는 물, 전기, 미세먼지, 주차공간 등의 정보를 모두 모니터하고 관리한다. Such connected infrastructure allows IoT technologies to have a bigger impact on the city. 사물인터넷은 이처럼 네트워크화된 도시 인프라를 통해 도시 생활 전반에 더 큰 영향력을 미친다. “What’s makes Songdo special is that it was aligned as a smart city from the beginning and that people were developing different services for the end-customers,” Caspar Herzberg, president of Schneider Electric’s Middle East and Africa business, who was instrumental in smart city planning for Songdo, said in a phone interview with the Korea JoongAng Daily. 슈나이더일렉트릭의 중동·아프리카 사업 총괄 캐스퍼 허츠버그는 “송도는 처음부터 스마트 시티로 계획된 도시라는 점에서 특별하다”며 “실수요자들의 편의를 고려해 각종 도시 서비스들이 기획됐다”고 말했다. 그는 또 스마트 시티에 대한 고정된 개념은 없다고 설명하며 “그 도시에서 무엇이 가장 중요한가에 따라 각 도시는 그곳에 알맞는 기술을 (발전시켜) 더 잘 사용해왔다”고 덧붙였다.